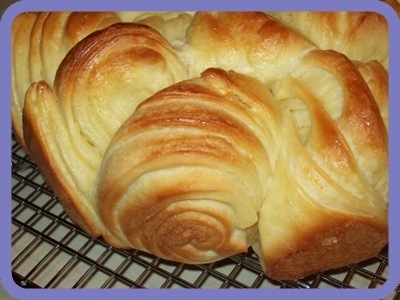 I keep going back to my all-time favorite: sweet breakfast buns! Do you like vanilla as much as I do? 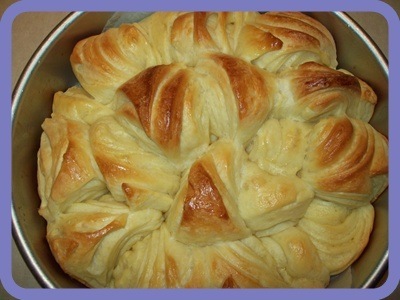 I found a recipe from CookingBread.com that not only had visual appeal but also had that pleasant sniff of vanilla. I was supposed to use a fresh vanilla pod but didn’t have one. Our supermarkets here don’t sell it (unless I’m looking in the wrong aisle). The next time I visit a natural food store, I’ll have to buy those vanilla pods as I’m sure they would put more “definition” to the taste. The recipe says you can use pure vanilla extract in place. I had enough for two batches so I used round and rectangular pans. The picture on the right gives you a close-up of one piece; notice how intricate the folds are. Their visual appeal comes from the uneven browning, giving you an attractive contrast of yellow and golden brown. The first time I made this recipe, it was long and arduous, but when it came out of the oven, I was convinced it was well worth effort. 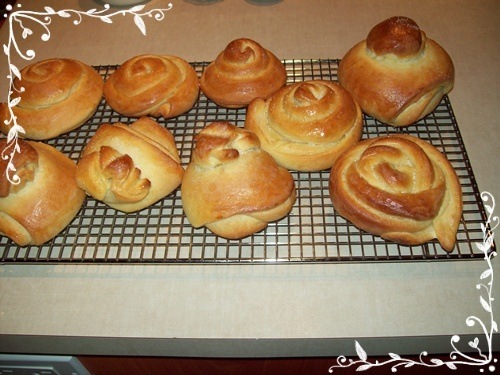 I was also overjoyed to see that my vanilla buns very much resembled the one shown on the CookingBread.com web site. Then I thought of Christmas. These vanilla buns would make a delightful giveaway during the holidays, and with just the right wrapper, you could always camouflage the irregular shapes. Or you could do the the original recipe and present them in a round disposable aluminum pan, wrapped in cellophane. I had some leftover wrapper and started to pretend that I was preparing them to give away to friends. I also wanted to see if my brother would ask me where I bought them. I cut the wrapper into nine pieces and wrapped the buns individually. As you can see below, my wrapper had tiny gold stars. If you think of it, these buns would look very attractive in a large white box. Your recipient won’t notice their funny shapes – or else think that you deliberately shaped them comme-ci, comme-ça! What are you planning to give friends and family this Christmas? 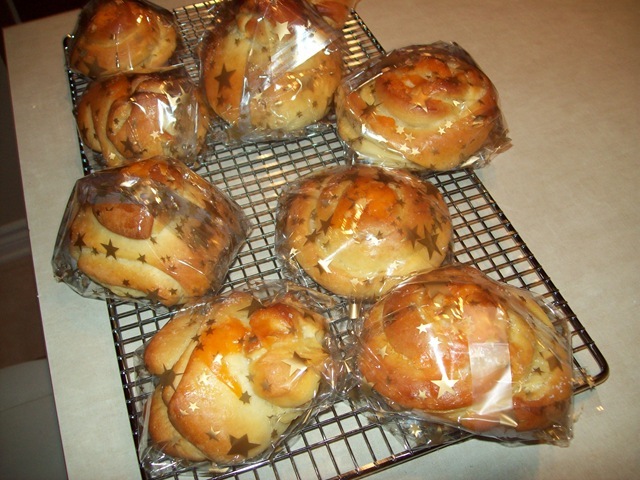 You’ll find the recipe for these delectable, delirious vanilla buns here: http://www.cookingbread.com/classes/class_vanilla_sugar_buns.html.